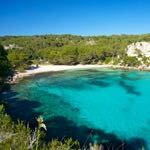 The Balearic Islands are firm family favourites, but if you’re looking for the best beaches, quiet resorts and beautiful, unspoilt scenery, you can’t go wrong with Menorca. Its coast is chiselled with secluded coves, lapped by shallow turquoise waters. And if you tire of the beach, there are enough activities – from boat trips to horse riding – to keep most families happy. All of our villas in Menorca have been hand-picked for their quality accommodation, family-friendly location and style – from charming hideaways in the countryside to contemporary villas close to the beach. Each villa in Menorca has a private pool and they are all a relatively short drive from Mahon airport, a big consideration for families. Our selection ranges between two and four bedrooms sleeping from three up to nine. Some villas are ideal for two families travelling together. There’s a real wow factor as you gaze out at the Mediterranean and the long sandy beach from Villa Bellamirada. With three en-suite bedrooms, it is a great choice for larger families. It’s located in Son Bou, which has a gently shelving beach plus bouncy castles, water slides and lots of other attractions for younger children. The large lawned gardens surrounding Villa Las Rocas make it a popular choice for families – there’s a real sense of escapism in this charming and characterful three-bedroom villa. Cala en Porter and a lovely sandy beach are both within walking distance of Villa Ines and it’s only a 15-minute drive from the airport. With two bedrooms, this modern property is a great choice for a smaller family. If you’re travelling with another family or are a larger party, we recommend Santo Tomas – it’s a spacious villa which sleeps up to nine. Location, location, location – it is situated virtually on the sandy Sant Tomas beach with shops and restaurants a short walk away. We offer villa rental only, or we can also arrange your flights, car hire, and a wide range of extras from cot hire to VIP airport lounge passes. All our villas include maid service, a welcome hamper and pool towels plus free wifi. Many have air-conditioning included. Check out our full range of villas in Menorca and the latest special offers.